First Listen: Joe Lovano Us Five, 'Bird Songs' The celebrated saxophonist and his percussion-heavy band have made a new album of Charlie Parker songs. But it isn't just that Lovano wants to play 1947 music with a 2011 lexicon; he also presents alternate, occasionally radical visions of those works. It's been more than 55 years since Charlie Parker last took up an alto saxophone, and just about every jazz musician still grapples with his legacy. Here's a man who was a central architect behind the revolution of bebop, the closest thing jazz has to a lingua franca today. What he improvised was often searingly fast but seemingly note-perfect; staggeringly intricate, yet filled with tenderness and beauty. In his prime, every recording he left behind was somewhere between a marvel and a definitive statement from the standpoint of playing, composing or some ineffable aesthetic something else. 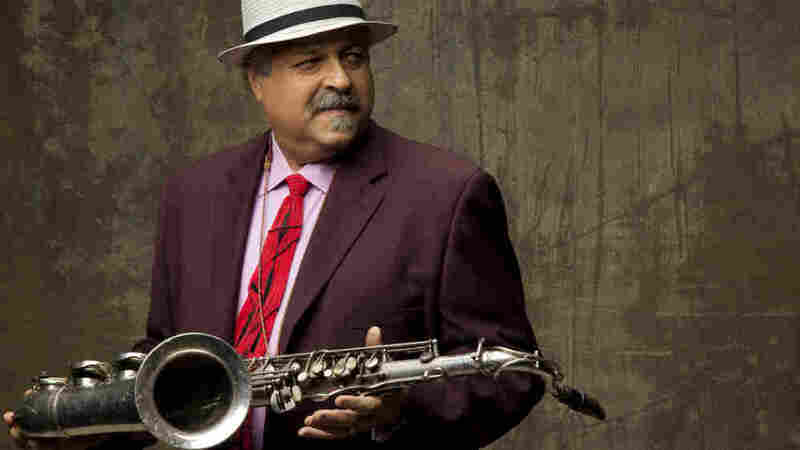 The tenor saxophonist Joe Lovano is 58 now -- not quite old enough to have meaningfully met Charlie Parker, but certainly old enough to have become one of the jazz world's most celebrated musicians. Like his peers (and antecedents, and successors), Lovano grew up in jazz working out in Bird's language. Hence Bird Songs, his new album of highly stylized takes on the Charlie Parker songbook. More numbers: This is Lovano's 22rd album for Blue Note Records alone, and the second with his band Us Five. It's an unconventional outfit; Lovano is clearly at the center with his tenor sax (or occasionally mezzo-soprano sax, or straight alto, or aulochrome), but he surrounds himself with two astounding drummers in Otis Brown III and Francisco Mela, plus the under-heralded James Weidman on piano and the well-heralded phenom Esperanza Spalding on upright bass. (Spalding is cast in a supporting role, eschewing the singing that's won her fame for her own projects.) The first Us Five record, Folk Art, featured only Lovano originals, purposely unsettled and adrift in percussion. The same general approach holds here with Bird's tunes; Lovano's arrangements feel a bit like reinventing the wheel by making it less round. It isn't just that Lovano wants to play 1947 songs with a 2011 vocabulary; he's presenting alternate, occasionally radical visions. These songs are slowed down, torn apart, reconfigured, mashed together, impressionistically meditated on and pried open for investigation. This isn't done lightly: Bird's music is iconic source material, at least for jazz musicians, if not for American culture at large. But this new record proves that there's plenty of space to imagine yourself in it. Bird Songs will stream here in its entirety through Jan. 12, when NPR Music and WBGO present a live webcast and recording of Joe Lovano Us Five as part of the Live From the Village Vanguard concert series.